This is so post-modern it makes my head spin. 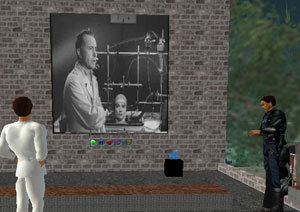 Folks in the online world Second Life have been staging their own version of Mystery Science Theater 3000. (For those of you who are clueless on this, Mystery Science Theater 3000 (MST3K for short) was a brilliant cable TV show with an odd premise... a slacker guy and his robot friends are imprisoned on an orbiting spaceship by a mad scientist who forces them to watch terrible movies. The gimmick of the show is that the guy and his robots make a running commentary on the film, wisecracking their way through the film with a rapid-fire steam of jokes, insults, double-entendres and puns). From the screen shots on New World Notes, the SL folks are watching some of the very same terrible sci-fi movies that the original MST3K folks used. (In the photo above they're making fun of one of the great all time cinematic turkeys, "The Brain That Wouldn't Die"). So, let's think this through...you start with a '50s sci-fi movie, which 30 years later becomes the subject of a TV show where people (well, one person and two robots actually) watch the movie while you watch them watching the movie. Then, ten years later people sitting at their computers watch the computer representations of other people watching that same movie from the 50s in a recreation of the TV show from the 90s. Got all that?